The multiple elements of Integrated HSEQ MS (Health, Safety, Environment, and Quality Management Systems) require the creation and maintenance of documents and records. The many documents involved make it critical to have a procedure in place that manages all aspects of the documents, from creation to archiving, ensuring efficient functioning of the system. This process, an essential element of ISO 14001, 9001, and 45001 is necessary for the success of any management system and is referred to as Document Control. To be sustained, the document control business process requires clear ownership, with roles & responsibilities and competencies defined and accepted by the responsible parties. The challenge comes in ensuring consistency in the application of the requirements. archiving the old documents to avoid duplicates and ensuring that only the most recent copy is provided for storage and upload to any HSEQ MS electronic systems. implementing the rules around privacy and security are ensuring that they are widely understood. It is important to understand the purpose of all the different types of documentation and what their specific requirements are. Information and its supporting medium i.e. any paper or computer file that contains HSEQ MS information to be followed (e.g. HSEQ and technical operating procedures, records and forms). Documents are live, eg they reflect a “what” or “how” that can be changed by the owner. A document stating results achieved or proving objective evidence that activities were performed. These are not live documents but rather provide a snap-shop in time eg a record is a filled out form or template referenced in a procedure or work instruction. Once filled out they are not live and subject to change. Those documents that have been replaced by a new version or are no longer required. Defined current documents that are used to plan and/or control any processes or operations that affect the HSEQ MS.
Any copy of HSEQ MS controlled documents that are used for reference purposes only. These documents must bear the markings “uncontrolled copy”. Or any paper or computer data file that contains HSEQ MS information to be followed and is not controlled. An index for controlled documents that define the HSEQ MS. The master document list usually contains, at a minimum, the title, and the date of issue, the revision date and location of the document. Extensive documentation is not effective documentation because of the burden of maintaining it, and being held accountable for all its requirements. Mantras “Say what you do and do what you say” and “it didn’t happen if you can’t prove it through documentation and records” should be kept in mind as you develop the minimal amount of documentation required. To filter what to document, analyze your business processes to determine what is needed. For example, beyond the required HSEQ MS element documents, the safety-critical processes and procedures often require written policies and procedures. Hazard and risk assessments are also a good place to start in determining documentation and record needs, as is the legal registry. Please note some elements of ISO management “Plan-Do-Check-Act” systems require documentation to be auditable and meet third-party certification requirements. documents, including records, necessary to ensure the effective planning, operation and control of processes that relate to the management of HSEQ related aspects and risks. All documentation must be legible, dated (with dates of revisions) and readily identifiable, maintained in an orderly manner, and retained for a specified period in most certification programs, to meet regulatory expectations and help provide a due diligence defence in the event of an incident. Procedures and responsibilities should be established and maintained concerning the creation and modification of the various types of documents as per some of the generic roles and responsibilities referenced above. The document hierarchy defines the structure with which the HSEQ management system documents are created. 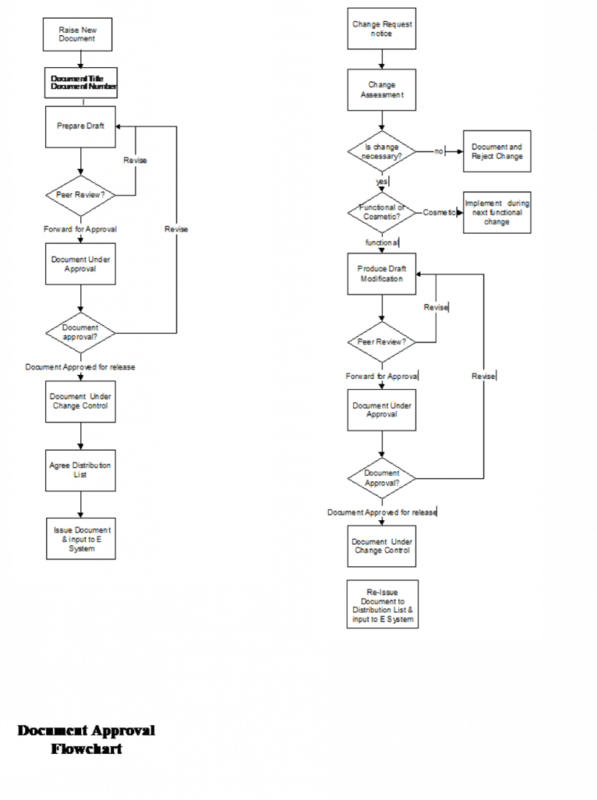 This document Hierarchy is often portrayed as a pyramid, with the levels reflecting the status and quantity of documents typically developed within an operationally excellent HSEQ MS. 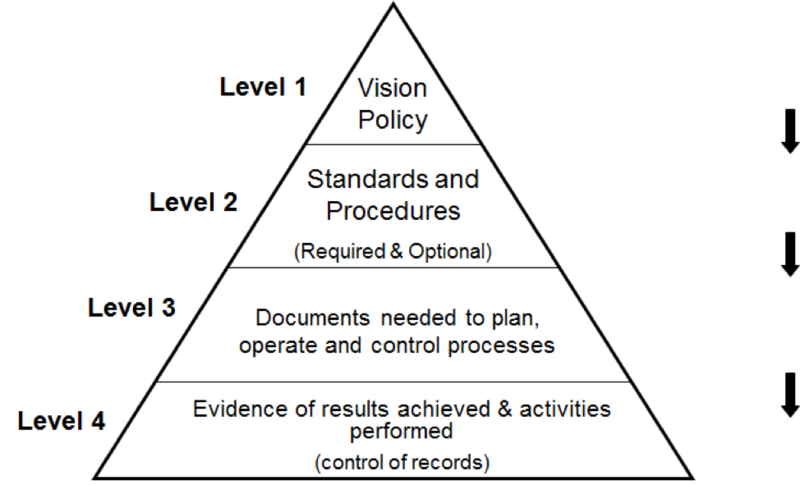 Vision and Policy documents are useful to customers as they provide assurance that senior management has defined and specified requirements/expectations for key business HSEQ related business processes. The Policy establishes the statement of values and commitments and is the guiding principle for the Vision. - describe the Who, What, When and Where of the business processes used to meet the requirements of the higher level policies and Standards. – describe the process flow, linkages, combination and integration of departments, functions etc. Level 2 documents can be created either based on department or by cross-discipline teams focusing on specific elements of HSEQ MS. These documents should be made available at point of use: eg Sharepoint type software so workers have access. These documents explain the details of specific tasks or activities – the “how” of performing a specific task. The need for documentation is based upon the complexity of processes, workforce stability, past issues, regulatory needs, and industry standards. These documents must be available, known and used by personnel and must be kept current and controlled to achieve operational excellence and high HSEQ performance. Examples include guides, work instructions, plans, forms, drawings, flowcharts, work practices, training plans, computer templates. These documents provide objective evidence of activities carried out and the results achieved in accordance with Levels 1,2 and 3 documentation. Active Records are those which are maintained for a period of one to two years within each department as required to conduct day-to-day operations. no longer required by the department and therefore must either be destroyed or retained to meet shareholders, contractual, or regulatory requirements. Administrative Value The record is required for employees to perform their duties. Audit Value The record is part of an audit trail. Historical Value The record is of importance in documenting the organization’s history and contribution to their stakeholder community. 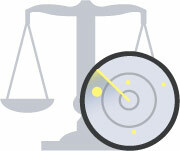 Legal Value The record provides evidence to support organization’s position in a legal proceeding. The emphasis should not be on the ‘system’, but on the implementation and maintenance of the HSEQ MS. HSEQ documentation should be an integral live functioning support for the day to day business processes. Where possible multiple needs should be integrated into single documents. Beyond the step by step instructions for the workers, the procedure can contain needed information on health and safety/process safety-related hazards and controls, quality management issues, and environmental aspects. The documents should also be written to as low as possible grade level to facilitate the use. Photos should be utilized as a visual aid at the task level. Any new or modified documents should be reviewed to determine their impact on operations and companies should consider using an implementation date and effective date strategy to ensure adequate time is provided for training and awareness. When creating an integrated HSEQ MS that already has an existing and comprehensive document control system (e.g. a document control system implemented as part of the ISO 9000 quality system), the existing document control should be used instead of creating and maintaining a new and separate system. This will cut down on user confusion and facilitate training and awareness. Each controlled document must bear a unique identification, issue date, revision date and show approval where appropriate, and documents and/or data printed from the HSEQ MS company Intranet site should be identified as printed by a privileged user and marked as controlled. Due Diligence refers to all reasonable care to protect the environment whenever possible in every situation. It can also contribute to a successful defence of a company in the event of an incident or at least mitigate potential penalties. Document Control helps to ensure due diligence by ensuring that the current versions of relevant documents are available at all locations where operations essential to the functioning of the HSEQ MS related to the incident were performed. Examples include maintenance and inspection procedures and records, sampling records, employee and contractor training, operator manuals, work instructions, alarm systems and records, emergency response plans, drills, equipment etc. At the very least one should be able to prove that the documentation is current and accurate. that employees are following their requirements. Procedure adherence checks should be performed to validate the efficacy of the documents. Document Control helps organizations verify their conformance with all legal and other requirements as well as facilitate the implementation of an effective management system. To maximize the benefits of document control, it is critical to ensure that all company personnel follow the system business processes when creating, reviewing, updating and retaining documents, policies, objectives, records, etc. that fall within the scope of the HSEQ MS or as required by legislation. It is the responsibility of the HSEQ MS representative to determine the best method for controlling HSEQ MS documents, but all personnel must be familiar with the document control procedures in order for the system to work effectively and create benefit versus increased liability. The documents should be developed by relevant subject matter experts and have clear ownership, and any changes should be through the formal management of change business process. Without this one source of truth business process that clearly defines the What and the How it is almost impossible to become operationally excellent.